Good Afternoon! We are back with more gorgeous inspiration today. 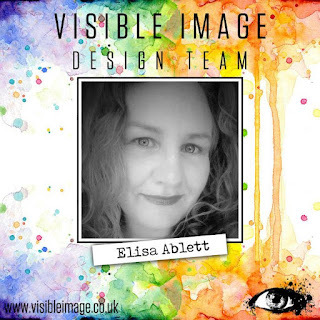 It’s my daughter’s birthday tomorrow and she has strict instructions not to read my blog today as I am sharing the birthday card I made for her for my weekly Visible Image Design Team inspiration. She recently moved to the seaside and although the weather has not yet warmed enough for playing on the beach we can’t wait until we can. The views are so beautiful at any time of the day. These photos were taken last year. 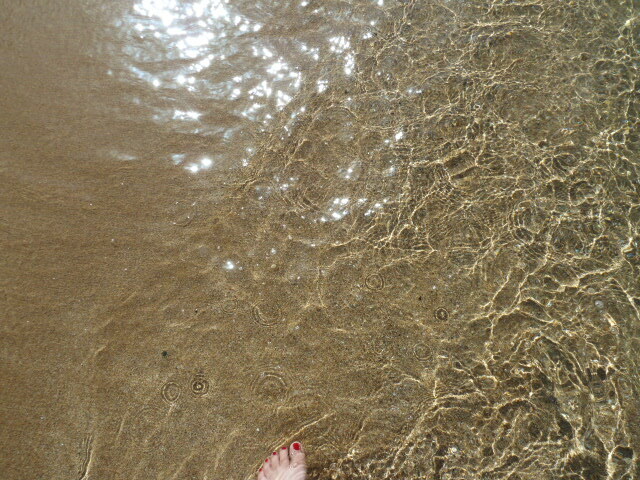 I knew that her first birthday card in her new home should feature the sea in some form. 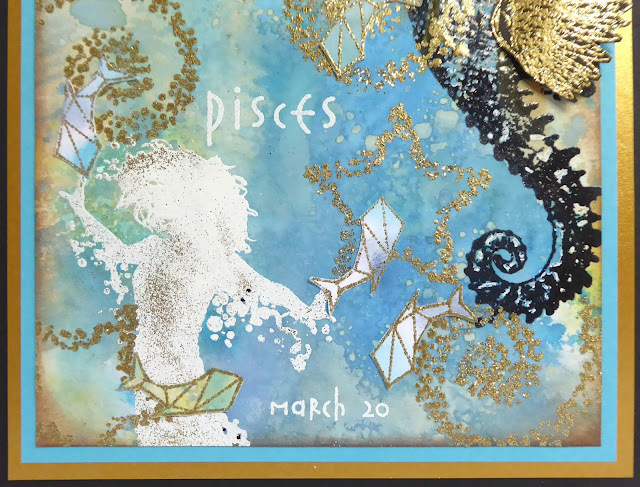 I also wanted to link in the Pisces theme as she was born the last “day” for Pisces. 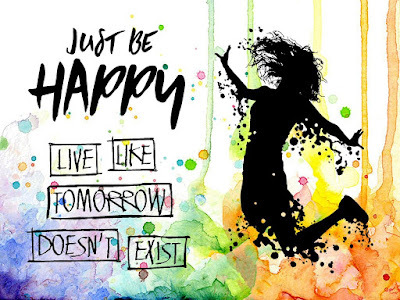 I would use my “Katie” from the Tomorrow Doesn’t Exist set and turn her into a mermaid.. yes seriously.. bear with me! 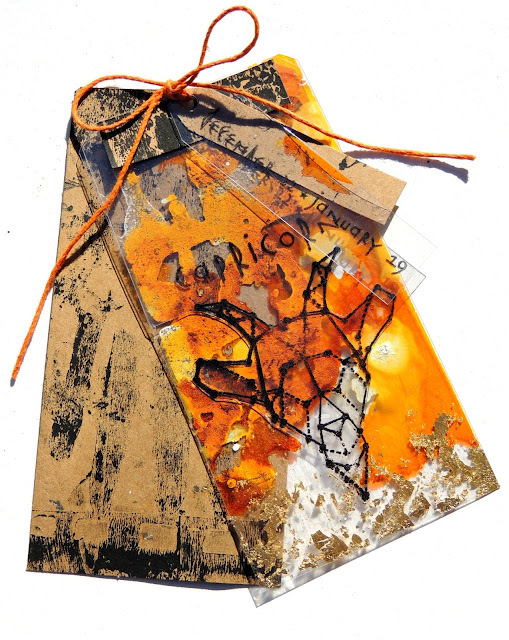 The background was created using some distress oxides and the wrinkle free technique. I added some sun rays using the rays stencil and gold ink. I stamped the seahorse and added some white highlights and to make him even more magical I added a wing from the angels are near set. This I gold embossed on black card and fussy cut out. I love the way the gold rays from the stencil shine through him. 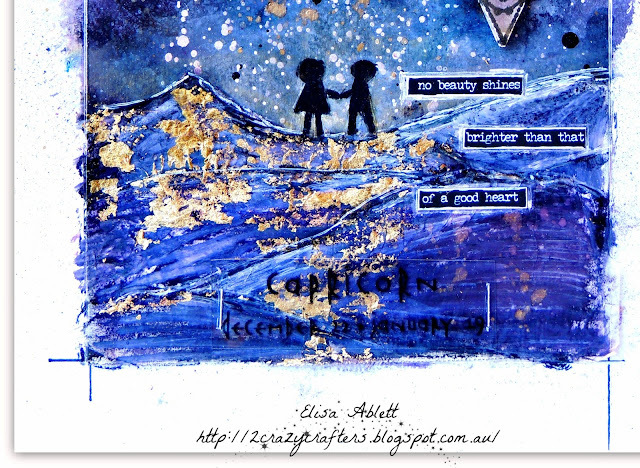 To add some sparkle and “magic” I used glitter gold embossing powder and stamps from the universal set. To make my “mermaid” I stamped “Katie” from the Live like tomorrow doesn’t exist set but positioned the stamp so that the leg didn’t appear. I embossed her in white with a pinch of gold powder too. 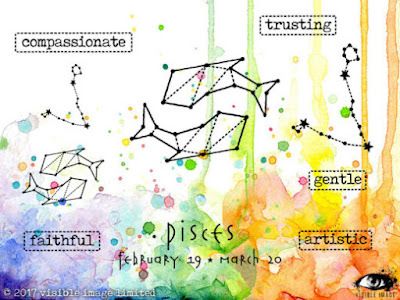 I was also able to just use the date from the Pisces set as this is my girl’s actual birth date, 20 March. 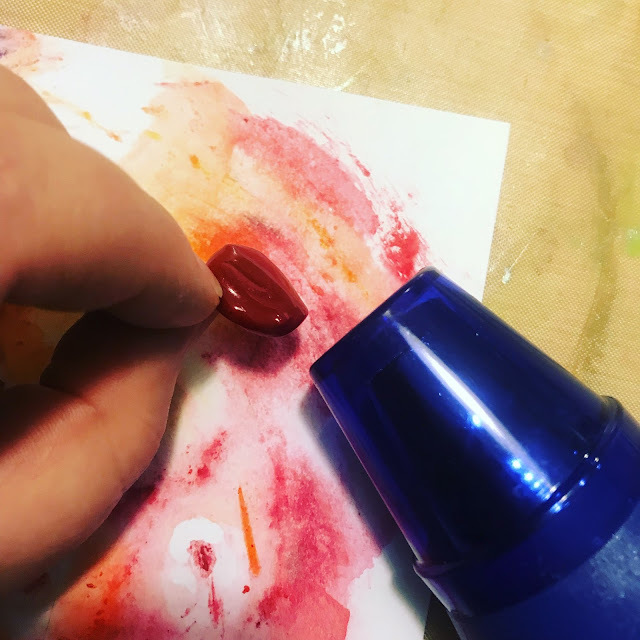 I stamped and fussy cut lots of fish and had them swimming in and out of the swirls and also between my “mermaid’s” hands. So a very happy birthday tomorrow to my darling girlie. 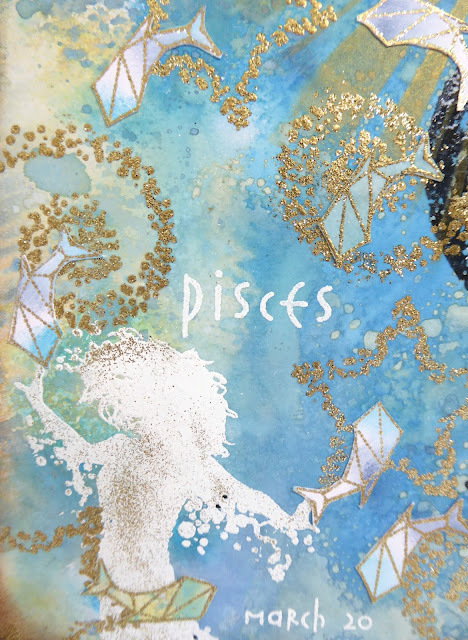 I hope she likes her special seaside Pisces card. It’s supposed to be the first day of spring tomorrow too… hmmm I think Mother Nature got a bit confused at the weekend! Yes the Beast came back with yet more snow! Thanks for stopping by and for all your very kind comments you take the time to leave me. Let’s hope this mini beast from the East moves on soon. Happy 1st day of Spring tomorrow. This card is amazing Jane! We just know she will absolutely love it!! 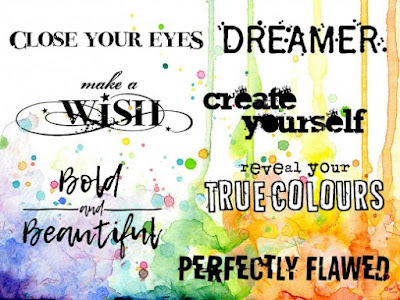 We will be back this evening with gorgeous inspiration from Heather Mitchell. Hope you are having a good Monday..
Hi there!! Thanks for visiting our blog today. We have been catching up with all the latest Design Team inspiration while ‘snowed in’ here in Wales! it’s still cold..so another crafty day for me !!! 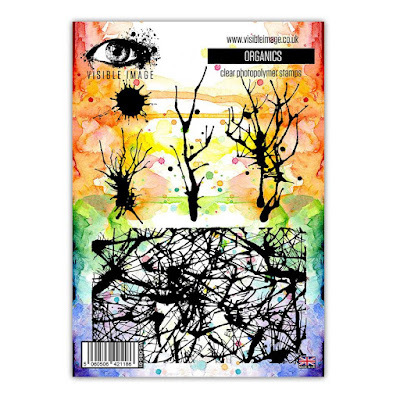 It’s my turn to share something cheerful, using some awesome Visible Image Stamps. 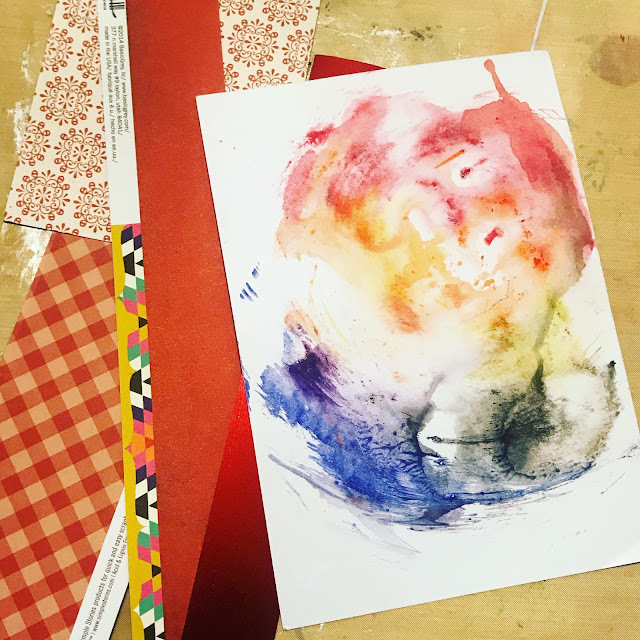 The background was created using Distress Ink re-inkers, although you could do the same with the ink pads too, just add some water, and using a paint brush, drip it down the card. The Capricorn’s head is on a piece of card that I smooshed through the left over ink, and heat embossed the goat using black embossing powder. 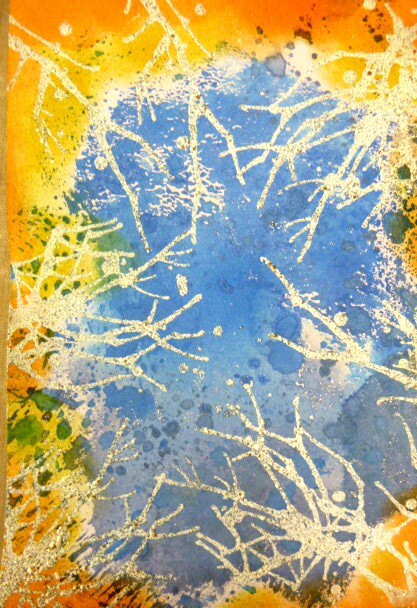 I stamped on the background using Oxide inks. Awesome drippage Pauline! 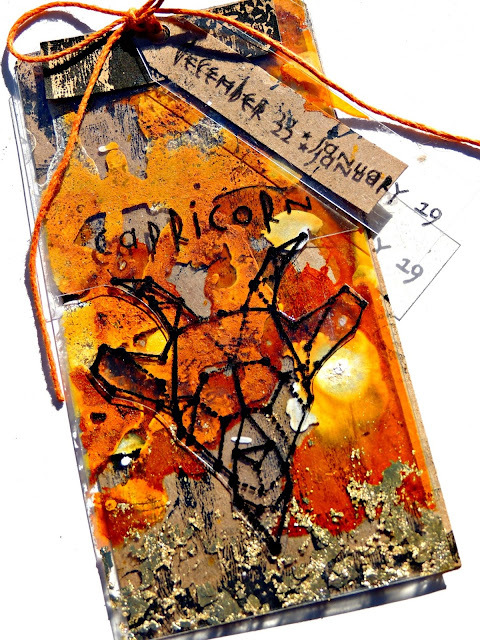 Love the layering of the Capricorn stamp, it looks fantastic! 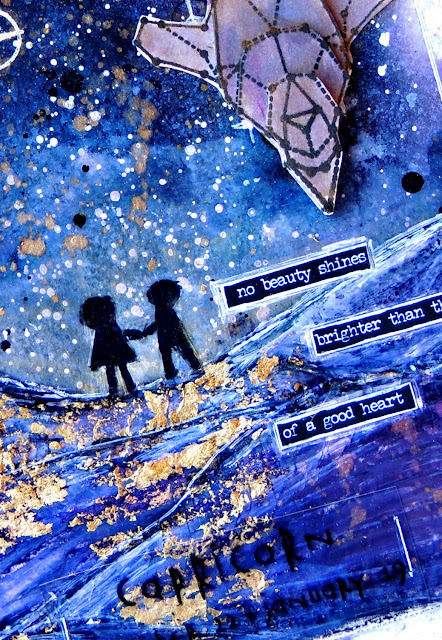 We will be back tomorrow with an awesome card by Becca, and a gorgeous tag from Veerle. I used some Squeezed Lemonade, Picked Raspberry and Seedless Preserve Oxide inks for the background, putting them onto a glass mat, and dragging the card through it, I then flicked some water at it, using a fan brush. 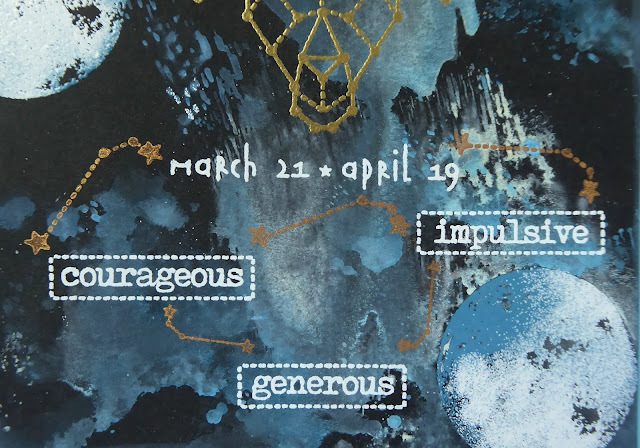 I stamped the Virgo head and all the sentiments, using Black Versafine Ink, onto a piece of white card, then coloured them with Distress Inks, and fussy cut them. 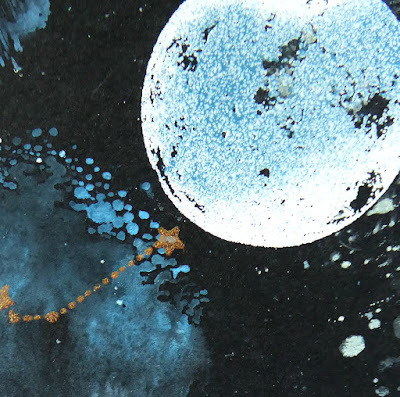 I stamped the dates and ‘Virgo’ along the bottom of the card, again using Black Versafine ink, highlighting them with a white pen, I also stamped the smallest constellation along the top. 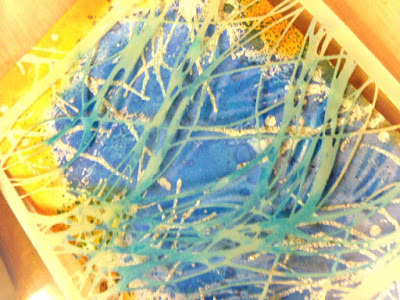 I then added all the elements with some 3D glue gel. LOVE this card Pauline! Miss Virgo looks beautiful, and the star constellations look like they are dancing!! We will be back later with more fantastic inspiration from our wonderful team! 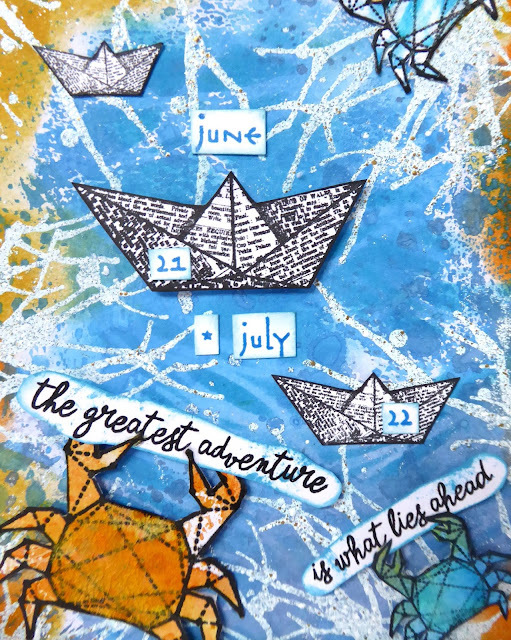 I’m back again to show you something that I’ve created using some awesome Visible Image Zodiac Stamps. 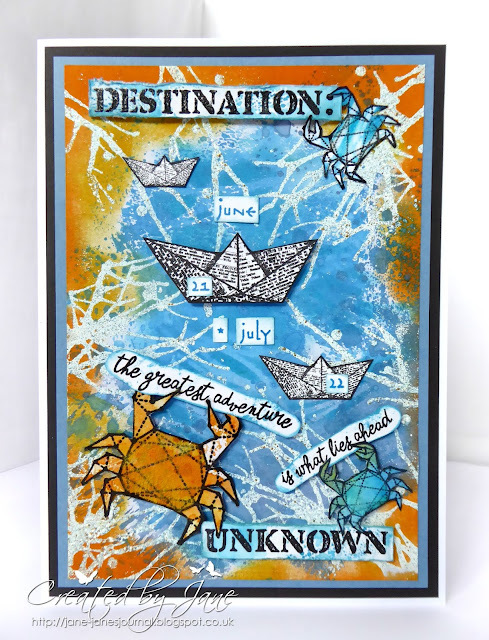 You may have spied this on our last TV show on Create & Craft, I used the ‘Libra‘ Zodiac stamp set, along with the big background stamp from the ‘Somewhere in Time‘ set. I created the background, using some acrylic paints, loads of colours just daubed on randomly. 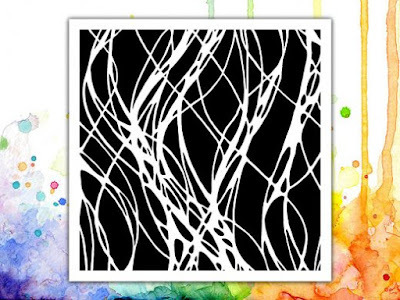 On top of my background, I stamped the big background splat stamp with an embossing pad, heat embossed it using Fluorescent Green Embossing Powder. 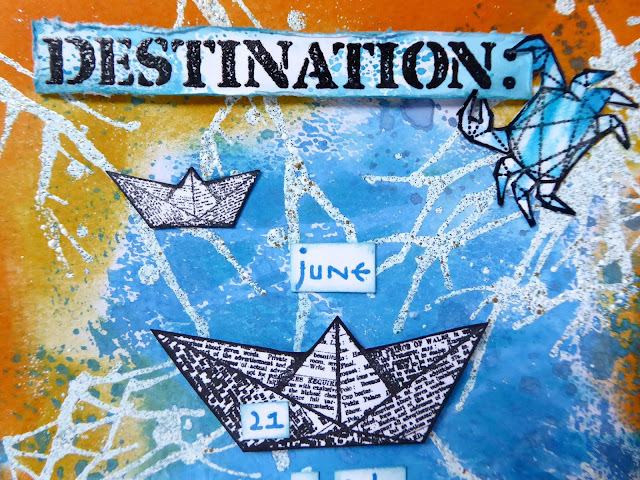 I also stamped the dates, and the constellation again using an embossing pad, but this time I used Fluorescent Blue Powder. On a separate piece of shiny red card, I stamped and heat embossed the scales, with Black powder, and then fussy cut them. I used 3D glue gel to add them to the card. 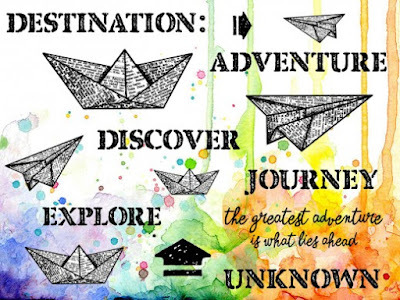 We will be back later with lots more fantastic inspiration! 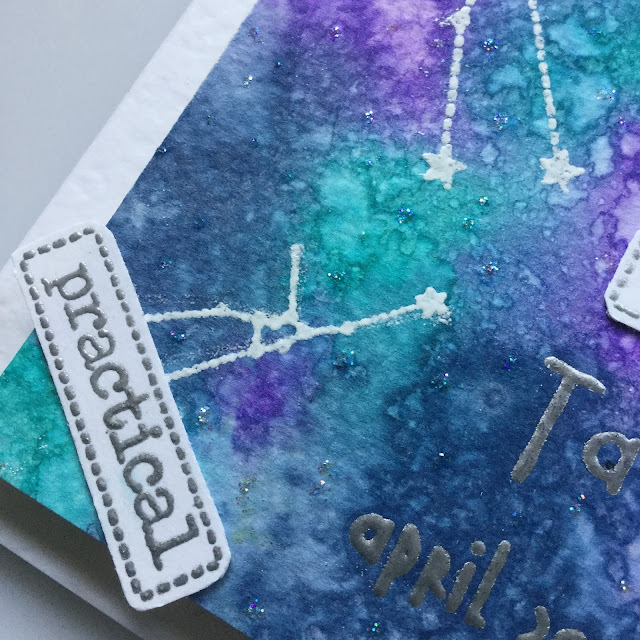 Today I am blogging my sample made with the awesome Zodiac Aries stamp set from the new “Written in the stars” collection. 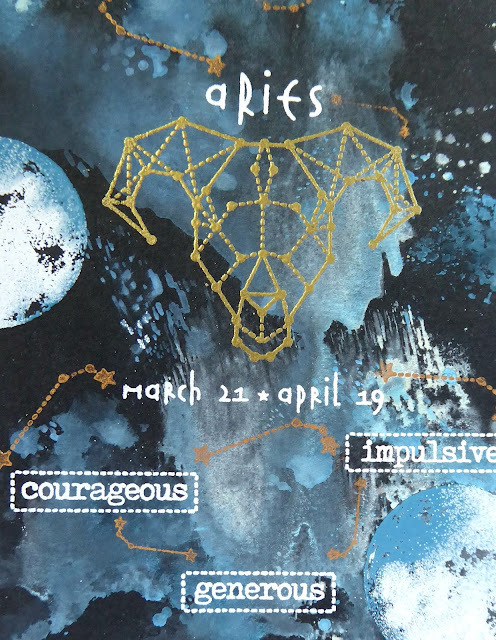 I am Aries myself so perhaps this is an early birthday card for me? When I first saw these sets I immediately thought of creating an “out of this world” scene to showcase my set. I look around me all the time for inspiration from Mother Nature but I do also love gazing up at the skies…so beautiful. I also love watching the moon and took these shots last year in Rhodes from our favourite beach restaurant. I made an inky background using distress oxides using the wrinkle free technique. 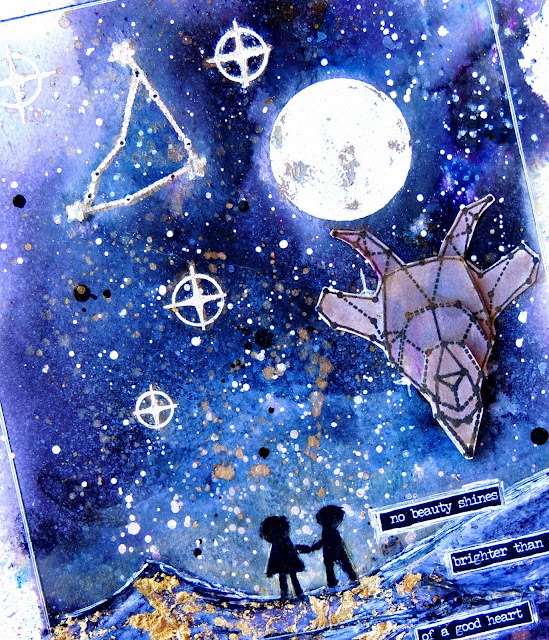 When it was dry I embossed the moon from the Believe in Unicorns stamp set using white and blue embossing powders. 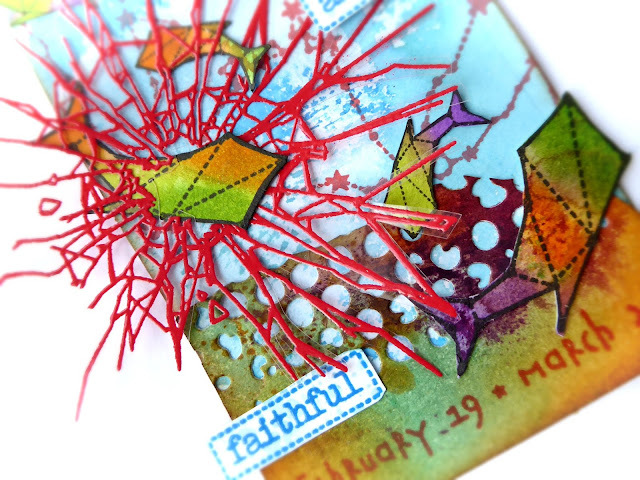 I then linked everything up with the fab constellation star stamps, also in the set. using rose gold ink. 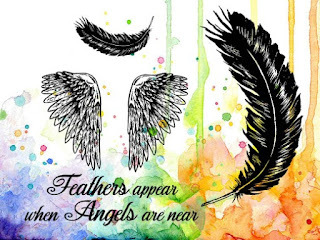 So those descriptions of Aries…. Still more inspiration to come here on the blog tonight and over the weekend, as we catch up with all the latest Design Team projects! You will spot that I used another of the new stamps on my tag.. I used the cracked glass stamp from the How Fragile set. I stamped and embossed it onto heat resist acetate and had my distress inked fishes swimming out from it. I fussy cut my fish which were also inked with distress. I stamped and cut out 3 of the 5 words which also come with this great set. 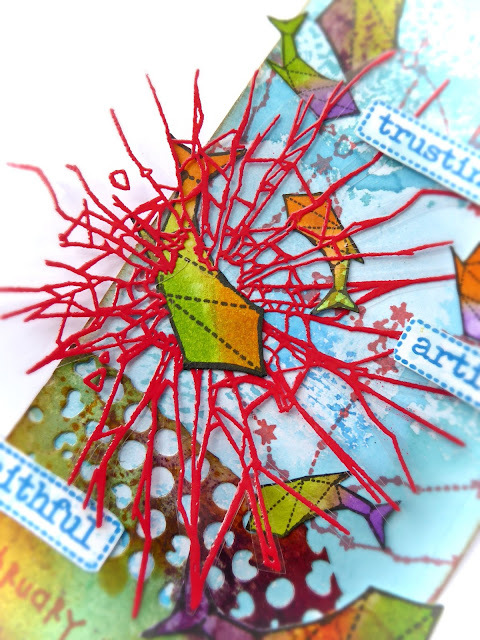 I linked everything up using the fun star constellations using red Versafine Clair. I die cut and added a snippet of inky mop up card too. Here are a couple of close ups.. Wow!!! How clever to have the fish leaping out through the crack! 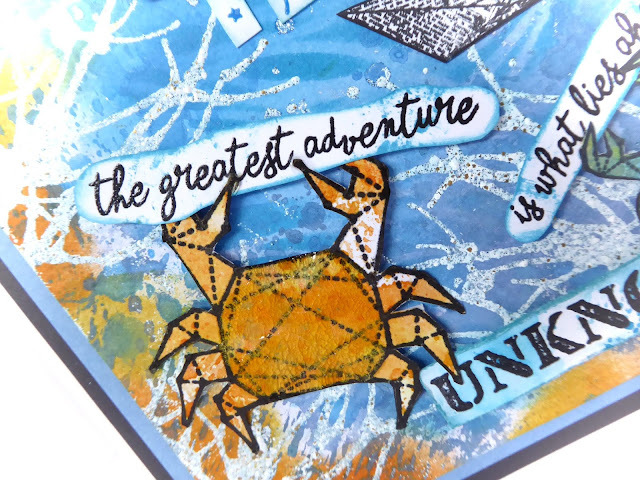 Love this tag so much..
We are on Create and Craft TV this weekend with our Zodiac stamps..
You can watch online too..
We will be back tomorrow with more gorgeous inspiration here on the Visible Image blog. Well we are all packed and ready for Phoenix! Just a few last things to do tomorrow.. 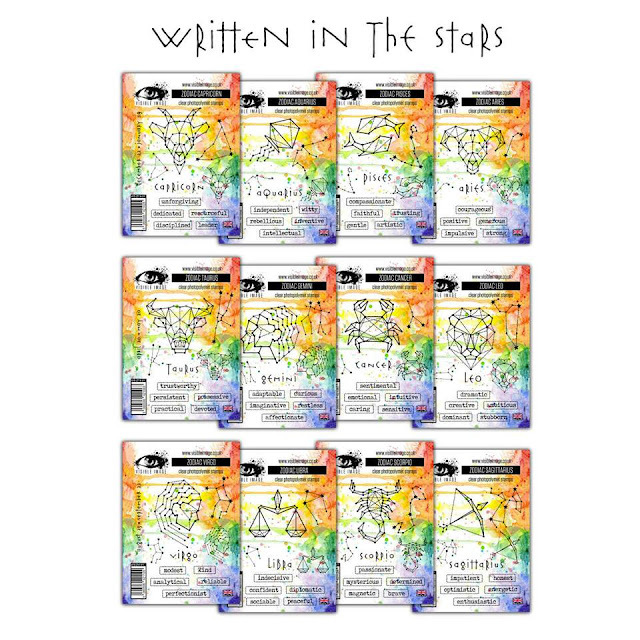 Among the newly released beauties at Visible Image is a whole set called “Written In the Stars” which has all of the signs of the zodiac and each of their attributes. I don’t necessarily follow my stars or anything like that, but every once in awhile I have fun reading my horoscope. 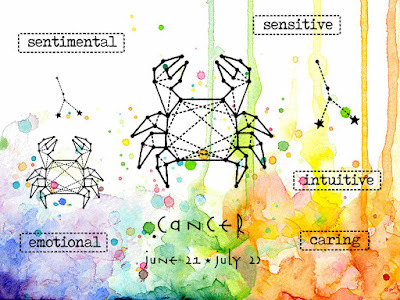 I’m a Cancer myself, and when I got my hands on the set, the attributes were pretty spot on “sensitive, caring, intuitive, sentimental, and emotional”. 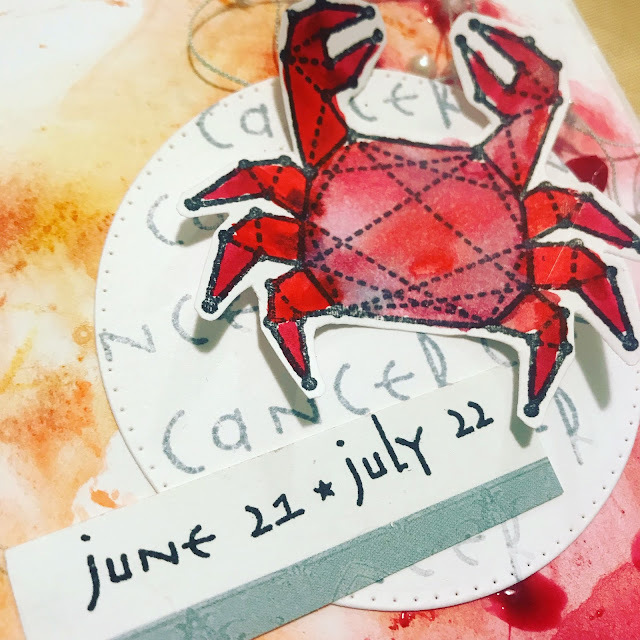 Since Cancer is a water element sign, the leftover paper totally spoke to me and I scrapped the scraps. 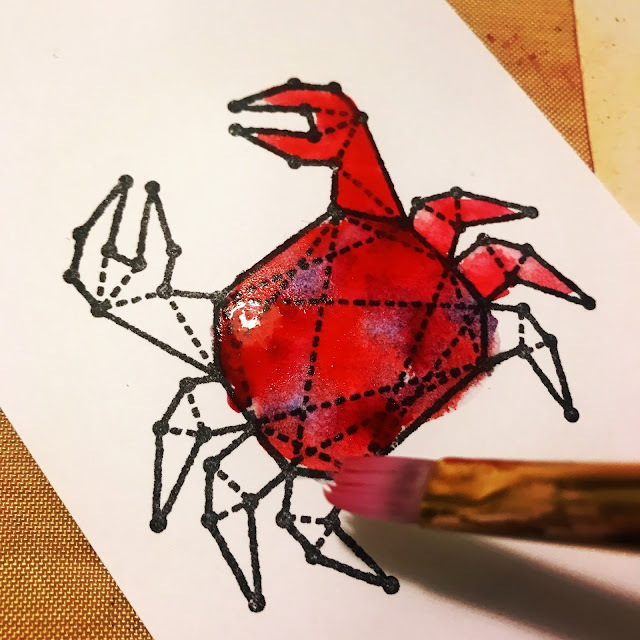 Continuing with the water theme, I pulled out my Kuretake Gansai watercolors and added some various shades of red, with hints of blue. I cut down the background, using mostly reds and orange hues. As I was chopping my paper to size, I spotted these old wax sealer things that I’ve never used and had a thought. 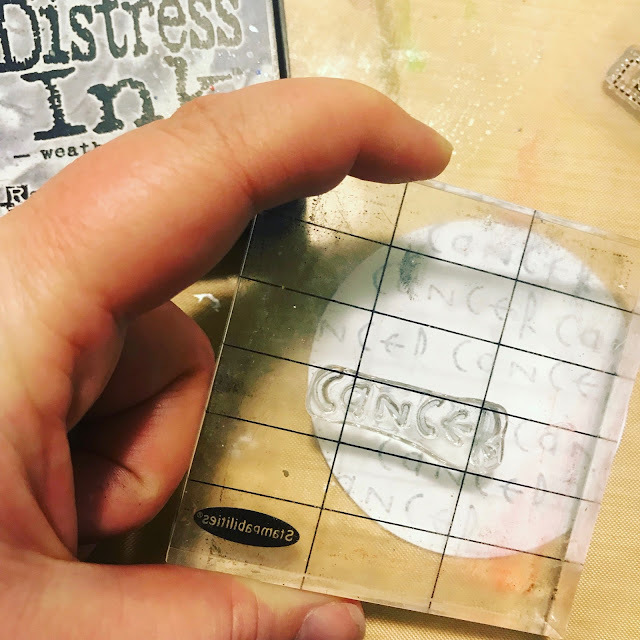 I used my embossing tool to heat the wax, and pressed it into the background. I’m definitely going to use this technique again in the future because it resulted in “wet” spots, even though the wax is perfectly dry! I used some Weathered Wood Distress Ink and repeatedly stamped the Cancer phrase over and over again. Some additional stamping, fussy cutting, and blue fibers later and my card was complete! 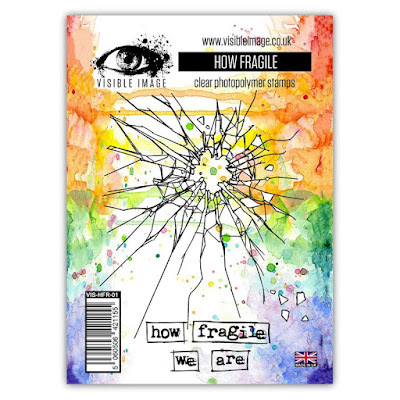 Head on over to the Visible Image shop to see all the new releases! Thanks for popping by! Hi! 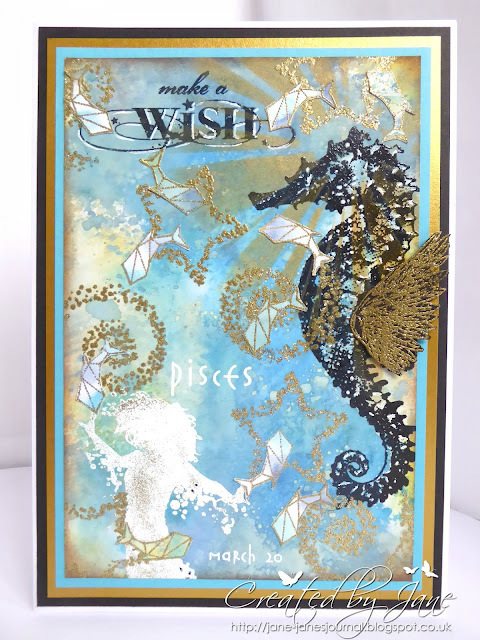 We are back with another super stunning card created with our BRAND NEW ‘Written in the Stars’ stamps! Today it is the turn of a new collection called Written In The Stars.. 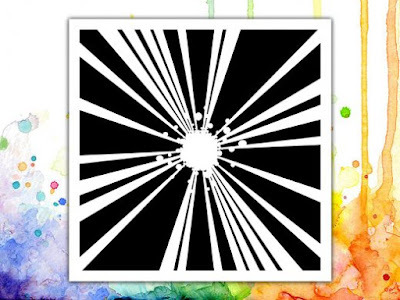 These are amazing zodiac stamp sets with a fantastic geometric look. 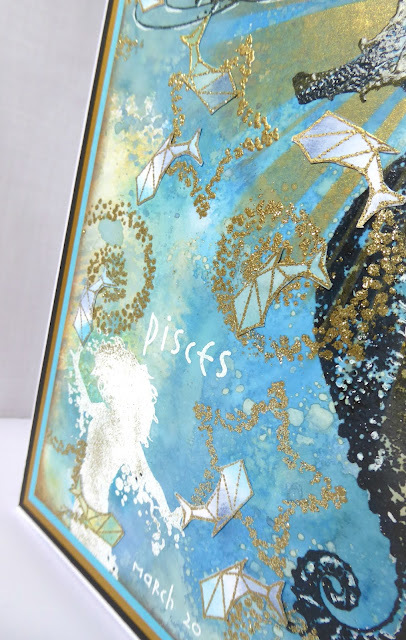 I love that each set comes complete with two sizes of the main image and two sizes of the constellations, as well as the name of the zodiac sign, the dates and some incredible words too! The elements in each of these sets work incredibly well on their own, or mixed with other sets in the collection as well as working with other completely unrelated stamps. Personally, I think the words are going to be SO useful. As soon as I saw these stamp sets I knew they would look stunning as light up cards, and they do! 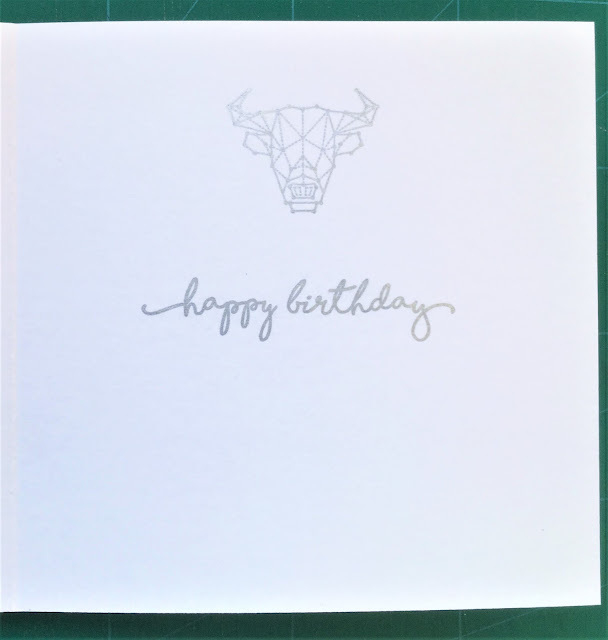 So here is the fabulous Taurus stamp as a light up card. Taurus is going to be a great stamp for me as I have a husband, a daughter and a grandson all born under that sign. I had to take that photograph at an angle to pick up all the silver embossing and dots of sparkle. 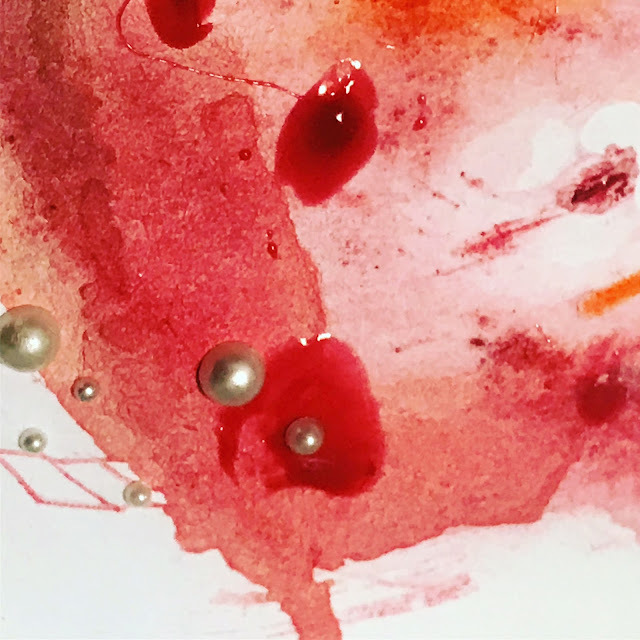 The background on this card was created by pouncing distress stains onto wet watercolour paper and whilst drying (when almost dry) spritzing water on to created droplets. 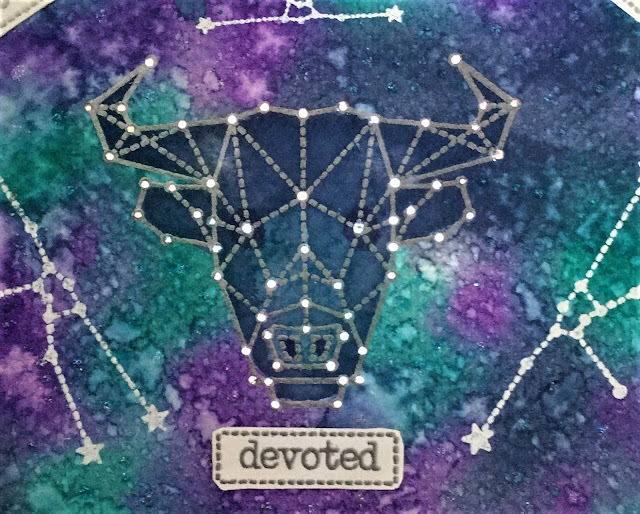 The water colour card was then left to completely dry before stamping and heat embossing the large Taurus image, ‘Taurus’ and dates with silver embossing powder. 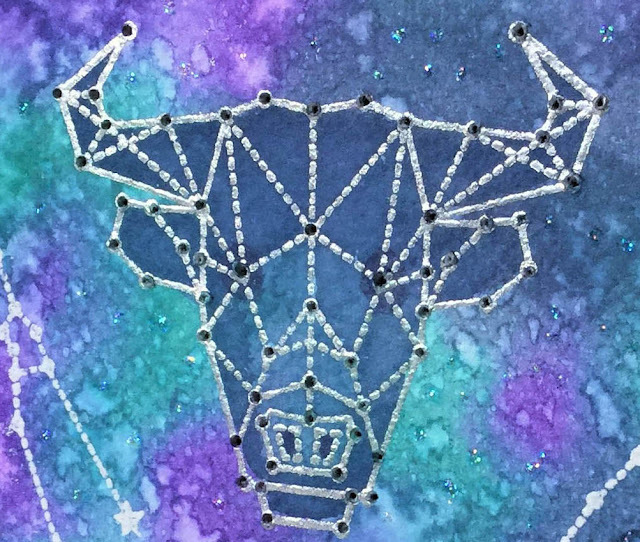 The points that I wanted lit up like stars in the Taurus image were pierced and I water coloured the inside of the Taurus image with distress stain to make it stand out. Above is the unlit version and below you can see it lit. 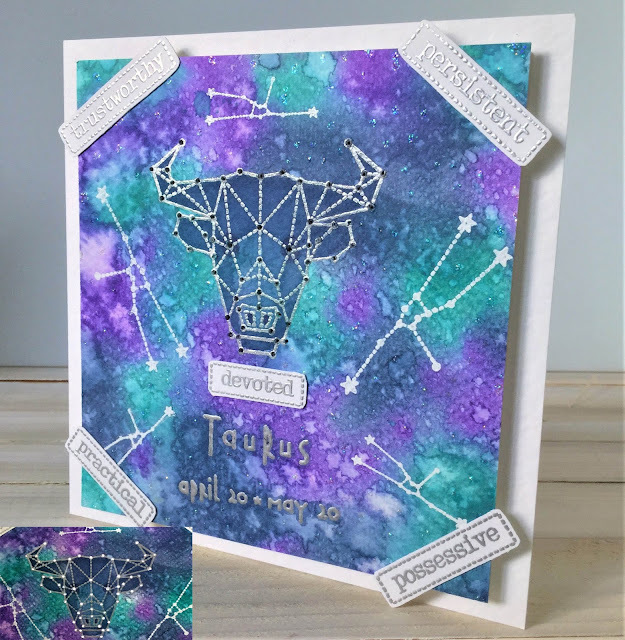 The Taurus constellations were heat embossed with white embossing powder and then random dots of stickles were added to give a hint of shimmery shine, representing more stars in the universe. A circuit was created on another piece of card using copper adhesive tape, a battery and chibitronics lights, making the ‘Taurus’ word on the card the piece to press to trigger the circuit and make it light up. The water coloured card was attached to the circuit card with 3d foam and it was all adhered to a card blank. Then I heat embossed the words on plain white card and cut them out to add onto the front of the card. Inside I used the small Taurus symbol with the happy birthday sentiment from the Go To Words set. These NEW stamps will be available for pre-order from 12th January! White card, Watercolour paper, Distress Stains (wilted violet, faded jeans, peacock feathers), Water spritzer, Versamark clear ink, Stampendous detail silver metallic embossing powder, Wow! Ultra bright white embossing powder, heat gun, Stardust Stickles, copper tape, disc battery, chibitronics lights, foam tape, double-sided tape. Amazing card Sharon! Totally agree these stamps are perfect to light up!! If you have missed any of our previews so far you will find them HERE!! We will be back tomorrow with more fantastic NEW stamps previews!! Not long now until you can place your pre-orders.. this Friday! Hi there! We are incredibly excited about today’s NEW stamps preview! 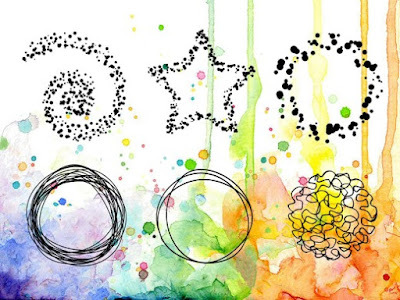 This gorgeous stamp collection includes the zodiac symbols in a really cool geometric design, star constellations, and star sign character traits.. what does your zodiac sign say about you? These fabulous projects will be blogged over the coming weeks, so keep an eye out for them! We really hope that you love this new collection ♡ Designed (of course) by Mark Alexander! Pre-order these stamps from Friday January 12th! Come back and visit tomorrow to see more exciting new stamps!! Thanks for checking out today’s preview! You can find our Day 1 previews HERE!